Please allow 10-14 days for orders to process. This striking 3D stadium art recreates some of the country’s most celebrated stadiums and the area surrounding each one. 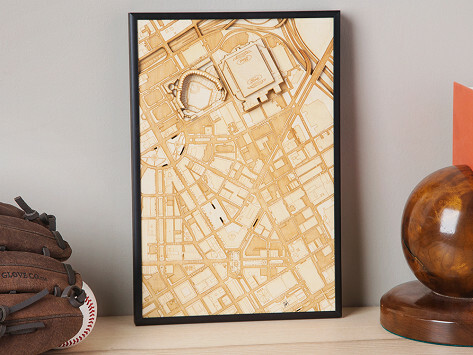 The map is made by layering laser-etched Baltic birch wood pieces that each capture different details—like rivers, roads, and buildings—in the neighborhood around each stadium. A black metal frame finishes off each eye-catching piece. Dimensions: Most Cities: 12" x 12"; Cleveland, Baltimore, and Pittsburgh: 12" x 18"; Ann Arbor and Toledo: 8" x 12"
My son’s in-laws loved this gift. They are big Notre Dame fans. I can't review this yet because I haven't given it as a gift but I believe the original art and craftsmanship will be a touchdown (pun intended). Zach Holt decided to push the creative limits of a laser etching machine by making artful 3D stadium maps that celebrate sports arenas—professional and college—and their fans. The Made in the USA pieces from Stadium Map Art capture details of not only some of the most famous stadiums in the country, but also the elements of the surrounding area, too. Landmarks like rivers, buildings, and streets help create a bigger picture, and make for an eye-catching map. The process starts with satellite pictures that Zach then zooms in on to capture the details of each stadium and its neighborhood. He creates a digital drawing of each image, laser cuts the pieces in Baltic birch plywood, and then assembles the layered three-dimensional bird’s-eye view by hand. The natural, attractive finish is an elegant way to show off your allegiance to a favorite team.